Badge holders will have sufficient knowledge and understanding of how to apply and tailor PM4SD™ in a scenario situation. Their individual project management expertise, complexity of the project and the support provided for the use of PM4SD in their work environment will all be factors that impact what the Practitioner can achieve. Badge holders have passed a multiple choice exam, scoring a minimum of 40 out of 80 (50%). The exam is a closed-book exam lasting 60 minutes. 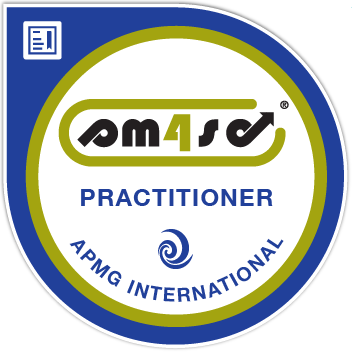 PM4SD™ badge holders have previously passed the foundation exam before completing the practitioner examination.